So, you didn't rent a Hamptons house—or score an invite to someone else's—this summer. 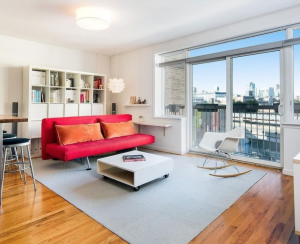 Not to worry: NYC is a city of islands, after all, which means you've got plenty of beach-going options that don't require more forethought than buying a MetroCard, grabbing a beach towel and sunscreen, and hopping on the subway. Or in some cases, hopping on the ferry. 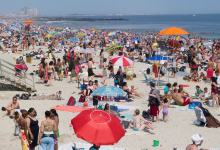 Stuyvesant Beach: We'll admit it: You'll actually have to leave Manahttan if you want the classic sunbathing, wave-riding beach experience. 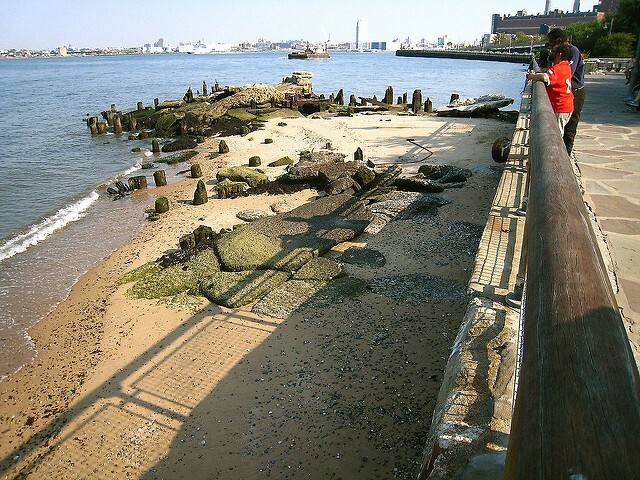 But, there technically is a beach option within the borough, located within Stuyvesant Cove Park in the East 20s. 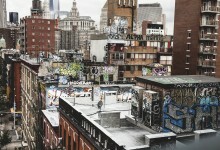 (Scouting New York has the background story here.) Pedestrians aren't meant to go on the sand and we certainly wouldn't advise taking a dip in this stretch of the East River, but it's still nice to know that you've got some kind of beach option just minutes from Midtown. The nearest subway stop is the First Avenue station on the L.
Coney Island: The king of Brooklyn beaches, Coney Island hardly needs introduction. 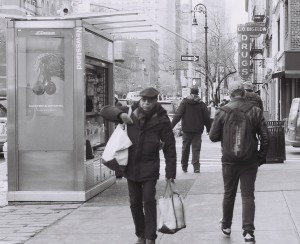 As part of a stretch of beaches that run along the southern edge of Brooklyn (its boundaries are technically from West 37th Street to Ocean Parkway), Coney's strength is primarily as a hub of food and entertainment, rather than a classic beach. (Plenty of people spread out their towels and relax on the sand, but the water can feel a bit grody, depending on the day.) 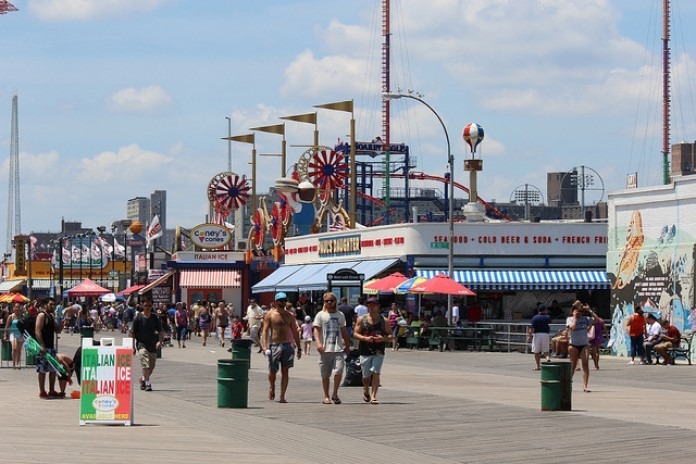 On top of attractions like the Coney Island Cyclones (a minor league baseball team with a stadium on the boardwalk) and the New York Aquarium, there's the famous boardwalk, with classic carnival rides and snacks including Nathan's Famous Hot Dogs, and places like Ruby's Bar & Grill to wet your whistle. To get there via public transit, take the D, F, N, or Q to Coney Island Stillwell Ave, or take the F or the Q to the next stop, which lets off right at the acquarium. 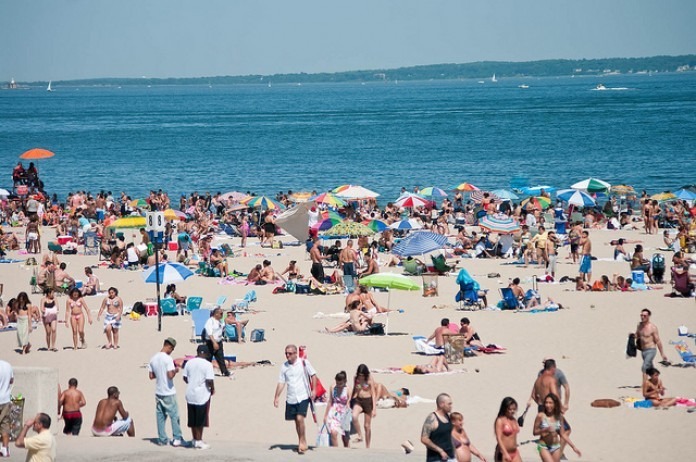 Brighton Beach: Coney Island's Russian cousin to the east (it runs from Ocean Parkway to Corbin Place), Brighton Beach sees a lot of crowd spillover from Coney, but offers a bit more of a classic beach experience—sand, surf, a boardwalk with a few restaurants and concessions. The big draw, though, is arguably what to eat after the beach—head away from the ocean toward Brighton Beach Avenue, and you'll find a no-nonsense wonderland of Eastern European eats (Gothamist has a guide here). 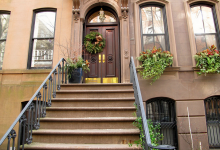 To get there by train, take the Q to Ocean Parkway, or the B, Q to Brighton Beach. Manhattan Beach Park: Also off the Brighton Beach subway stop—followed by a short walk or bus ride—you'll find Manhattan Beach Park, a relatively secluded and low-key option, located within the quiet residential area of Manhattan Beach. The actual beach is on Orient Boulevard between Ocean Avenue and Mackenzie Street, and features family-friendly attractions including playgrounds, barbecue pits, basketball, volleyball, and tennis courts, and a baseball diamond. One of your better options if you're looking to plan a day that'll also keep the kids entertained. Rockaway Beach: Though the Rockaways have (rightfully) gained a rep as a hipster hotspot over the past few years, this giant stretch of beach in Queens, spanning from Beach 9th Street to Beach 149th, truly has something for everyone—and plenty of space to spread out. Depending on where exactly you hop off the A train, you can find surfing, playgrounds, and an ever-expanding roster of tasty beach eats like Rippers, the burger-and-beer joint off Beach 90th Street. Most of the Rockaways can be accessed by the A train, though if you want to get off at the trendier spots around beach 90th and Beach 98th, you'll need to transfer to the S shuttle. Fort Tilden and Jacob Riis Park: Farther west along the Rockaway peninsula you'll find Jacob Riis Park and Fort Tilden, right next to each other and both accessible by taking the 2/5 to the Flatbush Avenue-Brooklyn College stop, then getting on the Q35 Bus that'll take you to the end of the Rockaways. 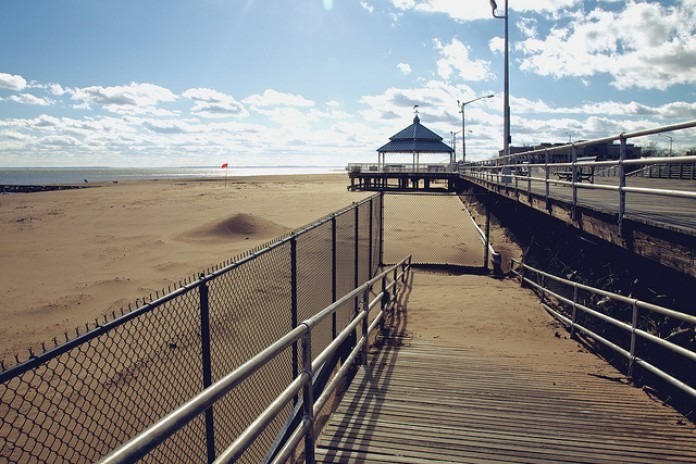 Jacob Riis Park has more amenities in the form of bathrooms, vendors, and the Riis Park Beach Bazaar, which features food, shopping, and events. Fort Tilden is on the other side of Jacob Riis, and is a bit more untamed—think dunes, rough waves, no lifeguards, and no cell reception. 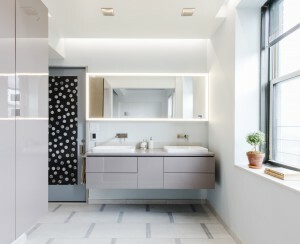 Tilden can make for a peaceful day at the beach, too, but requires some forethought as far as planning snacks and beverages, knowing where your nearest bathroom is, and figuring out how you and your friends might find each other without the help of your smartphones. Orchard Beach: As the lone public beach in the borough, Orchard Beach has garnered the nickname, "the Bronx Riviera," and is reliably one of the city's most popular beaches. Created at the behest of Robert Moses in the 1930s, the beach spans 1.1 miles, and includes playground and picnic areas, basketball, volleyball, and handball courts, and a variety of snack carts. Getting there can be a bit of a schlep, though; it requires taking the 6 to Pelham Bay, then hopping on the Bx12 bus. Midland Beach and South Beach: Admittedly, the beaches on Staten Island are a bit tough to get to if you're not taking a car. 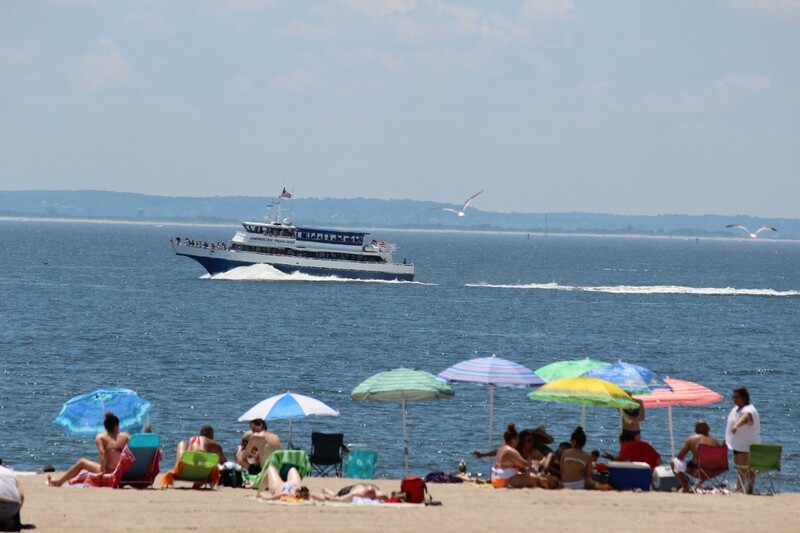 To get to Midland and South Beach, for instance (which are located right next to each other along the Franklin Delano Roosevelt Boardwalk and Beach), you'll need to take the Staten Island Ferry, then get on the S51 bus. But both are scenic options: Located on the shores of Lower New York Bay, Midland features playgrounds as well as tennis and bocce courts, while South Beach has a fishing pier, a bike trail, and a park specifically designed with senior citizens in mind (think chess and bocce). Cedar Grove Beach: Just a bit south of Midland and South Beach, you'll find a new kid on the block. 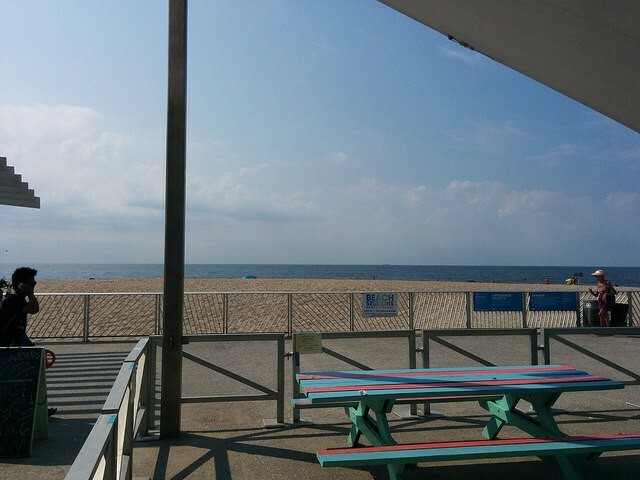 In an area that was once a private beach club and bungalow community now sits Cedar Grove Beach, a wheelchair-accessible public beach with amenities like free parking and "comfort stations" (places to get a drink of water and use the bathroom).